A term we are hearing more often these days is “sustainable lifestyle" due to global climate change concerns from the use of fossil fuels as well as increased health concerns from toxins and pollution. Though many still believe that these issues are beyond personal control and continue consuming as before, many others are realizing that change must begin at home with personal lifestyle choices. Choosing live more sustainably is what we all need to do in order to preserve, and hopefully increase the well-being of the planet, thereby benefiting each and every one of us. In short, a definition of sustainable living is taking no more than the environment can supply and renew. It is living in balance with nature in a symbiotic relationship without harm to the earth's ecology. It is meeting one's needs in the present without compromising the needs of future generations. One might use an herb plant as an analogy. If a recipe calls for basil, you have the choice to pick off a few leaves from the top or rip the plant out of the ground, roots and all. The first choice provides you what you need without harm to the plant. This allows the basil to continue to grow and thrive, later producing leaves and offspring for the future. The second kills the plant. It is no more and will never come back or produce more basil plants. Living a sustainable lifestyle is making the first choice in every aspect of your life, considering the consequences of your lifestyle choices and choosing to leave behind resources for generations to follow. A more eco-friendly lifestyle begins with awareness. It's being aware of personal energy use in the home and for transportation and taking positive, practical steps to reduce that energy use. It is being aware of the products you purchase and their impact on the environment and health. It is thinking about how, where, and why you dispose of trash, considering how it may be reduced, recycled, or reused. There are many resources available that will help you make informed decisions on how to make your home and lifestyle more energy efficient. Some are more costly than others, such as solar panels, but doing a few simple, inexpensive improvements at a time can go a long way. Simple things like waiting for a full load before washing clothes, switching to energy efficient light bulbs, and adjusting the temperature by a degree or two can have a positive effect. Find out about steps you can take by visiting the Home Energy Saver, offered by the US Department of Energy. In addition to these practical steps, there is one other that is too infrequently mentioned: just turn it off. This means turn off the TVs, video games, and computers, and instead enjoy a family evening playing a board game, taking a walk or bike ride, or visiting with neighbors. Part of a sustainable lifestyle is having strong relationships with family and community that can sustain through good times and bad. In our car-centric society with infrastructure built around the automobile, it can be difficult to wean ourselves from this dependency. If it's time to replace a car, choosing a small, fuel-efficient car or hybrid is a good idea. Additionally, steps can be taken to make more efficient use of transportation energy through the use of public transportation where available and car-sharing for commuting. When possible, leave the car at home and walk or ride a bicycle to both save on gasoline and improve health. Rather than make a number of individual trips for shopping and errands, save them up to do at once on a single trip. For family vacations, car trips use less energy than flying. There are many fun vacation options within a day or two of driving in every part of the US, with the journey being as much fun as the destination when planned well. Keep in mind that driving at 50mph uses 30% less fuel than driving 70mph. Studies have shown that every calorie of animal protein requires over ten times the fossil fuel energy to produce than a calorie of plant protein. Replacing a single day's meals each week with vegetarian options can save the equivalent of three hours of driving a week and more. Choosing seasonal, locally grown fruits and vegetables from farmer's markets or Community Supported Agriculture programs saves significant transport energy from bringing products in from long distances. It also supports local farming efforts and keeps the money in the community. Locally grown produce is also more flavorful and healthy since it ripens naturally in the field. Organic foods are grown or raised using sustainable farming methods without the use of synthetic fertilizers, pesticides, herbicides, antibiotics,or hormones, making the foods healthier to eat as well as healthier for the environment. Organic cloth products made from plant sources such as organic cotton, jute, hemp, and bamboo are not only grown organically, but they are processed and manufactured without harmful, toxic chemicals and dyes. Home vegetable and fruit gardening truly defines sustainable living, especially when done organically. Recycle organic waste material in a compost to use for fertilizer and use natural methods for pest control. 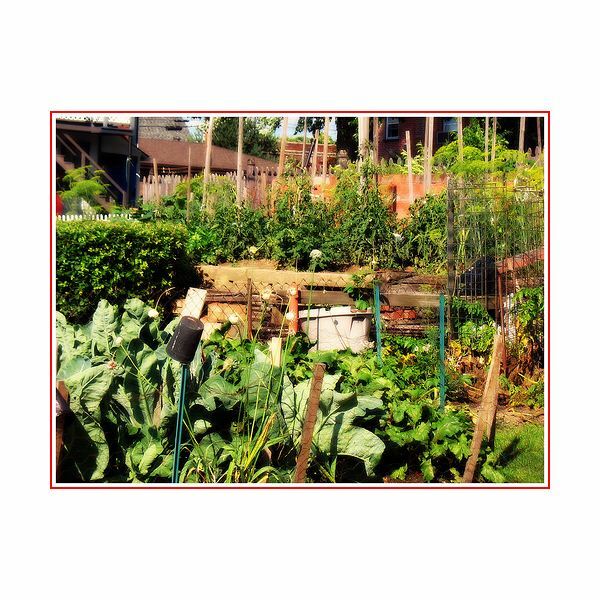 Coordinate efforts and trade with neighbors who garden to maximize the variety of produce as well as build community resources. Sustainability means avoiding products that poison and pollute the environment as well as our homes and bodies. Commercial, non-organic detergents, cleaning products, and even many personal care products contain toxic chemicals and petroleum-based ingredients that can result in serious health disorders. The run off from production and use pollutes water and soil. Choose simple homemade alternatives or purchase organic products that are safe for your family's health and the environment. In addition to participating in the community recycling of plastics, glass, paper, and metals, practice recycling materials to extend their use and save replacement resources. Before throwing anything away, consider how it might be recycled or reused by you or someone else. Old t-shirts make great cleaning cloths and can be used to stuff pet toys and bedding. Use recycled glass jars for storing left-overs rather than plastic containers. Compost organic waste. Reduce trash by eliminating the use of paper plates, paper towels, and plastic utensils as much as possible, using durable, washable alternatives. Get creative! These are but a very few suggestions to understand how to live a more sustainable lifestyle. It begins with awareness and the realization that every single person on the planet has a contribution to make, and the responsibility to make it. Through choices and action we can each create a healthy, sustainable environment for our children and their children. Discover How to Make Your Home More Energy Efficient, Energy Efficient Home Tips. Sustainable Consumption and Production, United Nations Department of Economic and Social Affairs, April 30, 2007. Sustainable Lifestyle Program, Empowerment Institute. 50 Steps to a Sustainable Lifestyle, Harrogate Burough Council. Home Energy Saver, US Department of Energy. Fanelli, Daniele, Meat is Murder on the Environment, New Scientist, July 18, 2007. Community Supported Agriculture, United States Department of Agriculture, National Agriculture Library.